There’s no denying the importance of the education sector in shaping the minds of tomorrow, and the vital role it plays in our economy. Therefore, premium onsite facilities at our local Western Australian schools are of the utmost importance. 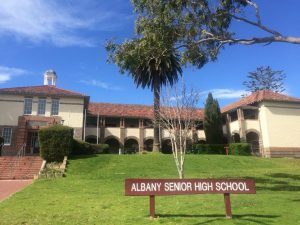 For these reasons, Wespray on Paving was thrilled to be part of Albany Senior High School’s resurfacing project. Working on the steps and walkways, we used a Bluestone finish with three contrasting flecks that add a sense of depth to the paving. 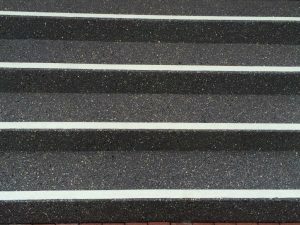 We also applied a 50mm white strip to the edge of the steps to increase visibility and safety. This edge strip is sprayed on with the same resurfacing cement that eliminates the need to repaint the area every year, which is necessary when you’re using standard paving paints. Overall, the project was a resounding success, and the school was very pleased with the results. If it’s time to add some life to your tired, old concrete surfaces, we’re here to help! Wespray on Paving can reinvigorate your surface, making it look as good as new. 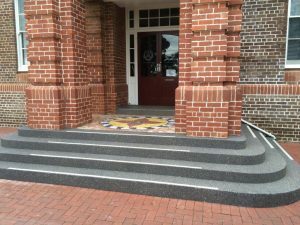 Specialising in decorative, slip-reducing spray on paving surfaces in the Perth area, we’ve been supplying businesses, schools, and local Government areas with our innovative resurfacing solutions, which add visual appeal, while ensuring safety and practicality. Contact the team at Wespray on Paving today to see how we can help with your next project.